421-423 Marlborough (33-35 Massachusetts) is located on the NW corner of Marlborough and Massachusetts, with 411 Marlborough to the east, across Mass. Ave., 425 Marlborough to the west, 31 Massachusetts to the north, and 424 Marlborough to the south, across Marlborough. 421 Marlborough and 423 Marlborough were designed by architect Samuel D. Kelley and built in 1889-1890 by Keening and Strout Brothers, builders, for Edwin B. Horn, Jr., a jeweler and real estate developer who lived at 11 Greenwich Park. 421 Marlborough was built as a six story, six unit apartment house, and 423 Beacon was built as a four story, four unit apartment house. Edwin Horn is shown as the owner on the building permit applications for both buildings, both dated November 26, 1889, and on the final building inspection report for 421 Marlborough, dated May 27, 1890. Edwin Horn purchased the land for 421-423 Marlborough on October 14, 1889, from Henry Lee, H. Hollis Hunnewell, and Augustus Lowell. The land was part of a larger parcel that Henry Lee and his partners purchased on February 20, 1883, from a real estate investment trust formed by Grenville T. W. Braman, Henry D. Hyde, and Frank W. Andrews. The parcel was one several tracts of land the trust had purchased from the Boston Water Power Company on March 1, 1872. 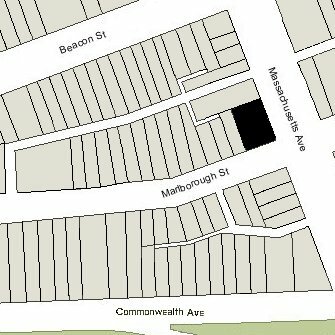 Click here for an index to the deeds for 421-423 Marlborough, and click here for further information on the land west of Massachusetts Avenue between the south side of Beacon and the north side of Commonwealth. On April 28, 1890, 421 Marlborough was purchased from Edwin Horn by Royal Elisha Robbins, an importer of watches and a principal organizer of the Boston Watch Company (later the American Waltham Watch Company). He and his wife, Mary Elizabeth (Horton) Robbins, lived at 44 Commonwealth. On June 12, 1890, 423 Marlborough was purchased from Edwin Horn by Elijah Anderson Shaw, a cotton buyer. He was a widower (his wife, Frances Emma (Dyer) Shaw, having died in March of 1890) and lived in Lexington. 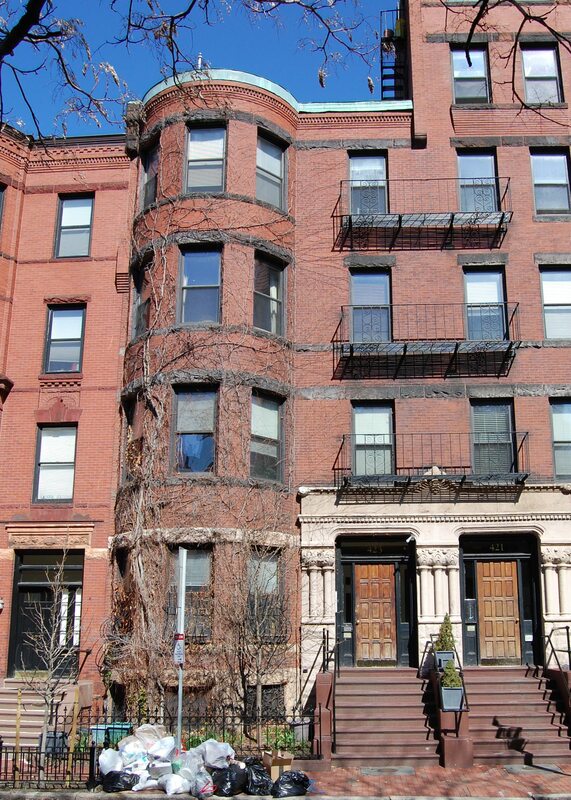 In the deeds to Royal Robbins and Elijah Shaw, Edwin Horn included a four foot easement across the rear (northern boundary) of 421 Marlborough providing access to Massachusetts Avenue for 423 Marlborough. On October 30, 1890, Elgin Burns, the janitor at 421 Marlborough, was killed in an elevator accident in the building. On November 7, 1891, Washington Butcher Thomas purchased 421 Marlborough from Royal Robbins, and on May 1, 1892, he purchased 423 Marlborough from Elijah Shaw. From this point, the two properties remained under the same ownership. Washington B. Thomas was an executive of the Standard Sugar Refinery, owned by his father, Joseph B. Thomas. and later would become president of the American Sugar Refining Company. A major investor in real estate, in 1895, he built The Marlborough at 416 Marlborough, and in 1898-1899, he built the Hotel Cambridge at 483-485 Beacon. He and his wife, Caroline (Wadleigh) Thomas, lived at 20 Gloucester. On December 26, 1911, Washington B. Thomas created the Marlborough Real Estate Trust, with Leslie C. Wead and Edward Peirce as trustees, to hold his real estate assets. When he established the trust, he transferred The Marlborough, the Hotel Cambridge, and the Symphony Chambers at 327 Massachusetts Avenue and 242-248 Huntington to the trust. 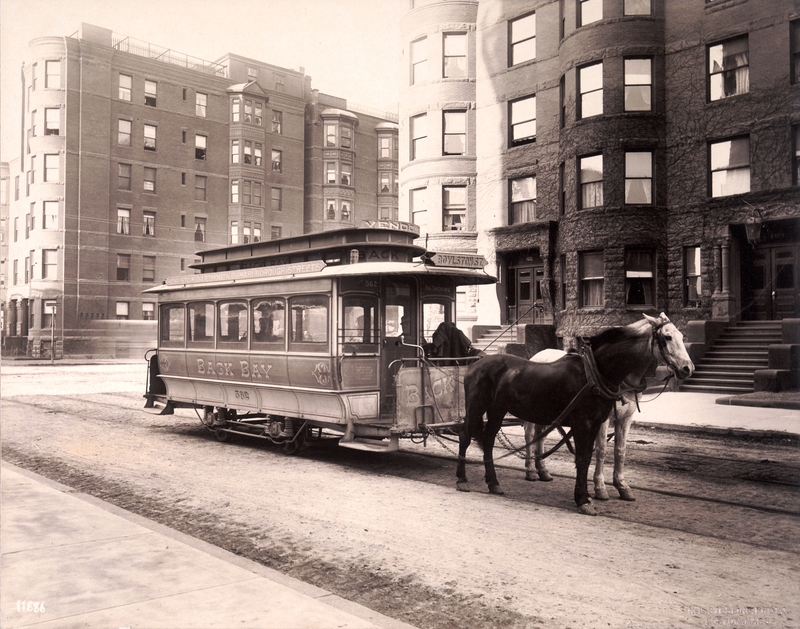 On January 19, 1912, he transferred 421-423 Marlborough to the trust. On June 1, 1925, 421-423 Marlborough were purchased from the Marlborough Real Estate Trust by Mary M. O’Brien, and on June 15, 1925, she conveyed the property to real estate dealer William N. Ambler. On November 2, 1925, 421-423 Marlborough were acquired from William Ambler by real estate dealer Edward J. Ball. On February 10, 1928, the Cape Ann Savings Bank foreclosed on the mortgage it held on 421-423 Marlborough and took possession of the property. On May 1, 1941, 421-423 Marlborough were acquired from the Cape Ann Savings Bank by Gladys L. Young, trustee of the Corner Realty Trust. She was employed by real estate dealer Wallace R. Marden, whose wife, Marjorie Lewis (Maclary) Marden, was the beneficiary of the Corner Realty Trust. The two stores had the addresses of 33 and 35 Massachusetts Avenue. Various businesses leased 33 Marlborough, and Wallace Marden maintained his real estate office at 35 Marlborough until about 1948. In November of 1941, the trust applied for (and subsequently received) permission to relocate the rear entrance of 423 Marlborough in order to enlarge the existing apartment for the janitor. On August 31, 1943, Gladys Young transferred 421-423 Marlborough to Wallace Marden as trustee of the Investment Realty Trust. In January of 1948, the trust applied for (and subsequently received) permission to increase the number of apartments at 421 Marlborough from six to ten by subdividing the units on the first through fourth floors. By this time, the two stores in the basement were apparently both being used as offices and are referred to as such on the permit application. In July of 1949, the trust amended its application to increase the number of units to twelve by subdividing the units on the fifth and sixth floors as well. 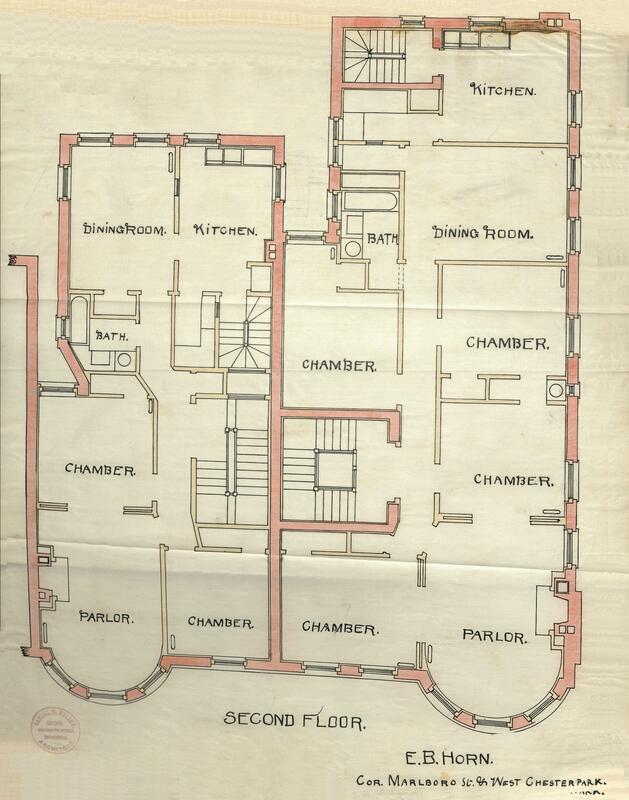 In March of 1950, the trust applied for (and subsequently received) permission to convert the basement area from offices into a “launderette” (laundromat), with an address of 421 Marlborough. “Laun-Dry It” continued to be located there until the mid-1960s. On October 31, 1961, 421-423 Marlborough were purchased from Wallace Marden by Ezra Wolfson, Alvin Wolfson, and Harold Wolfson, trustees of the Newbury Realty Trust, and on February 5, 1963, the property was purchased from the Wolfsons by Louise Robinson, trustee of the Louise Robinson Realty Trust. By 1966, the basement area had been converted from a laundromat into a restaurant, Ye Beef and Great Steaks. It continued to be located there until about 1970. In July of 1972, Barnett Samuels applied for (and subsequently received) permission to convert the basement area from a “sandwich shop and ice cream parlor” into a restaurant and bar. The basement space subsequently became Bully’s Pub in 1972 and 1973, and then the Fathers Five bar from 1974. The space was identified both as 421 Marlborough and 33 Massachusetts Avenue. On January 28, 1977, 421-423 Marlborough were purchased from the Samuels family by Andrew J. Saggese, Jr., trustee of the Drew Realty Trust. On December 26, 1978, he transferred the property to himself as trustee of the Fidelity Realty Trust. 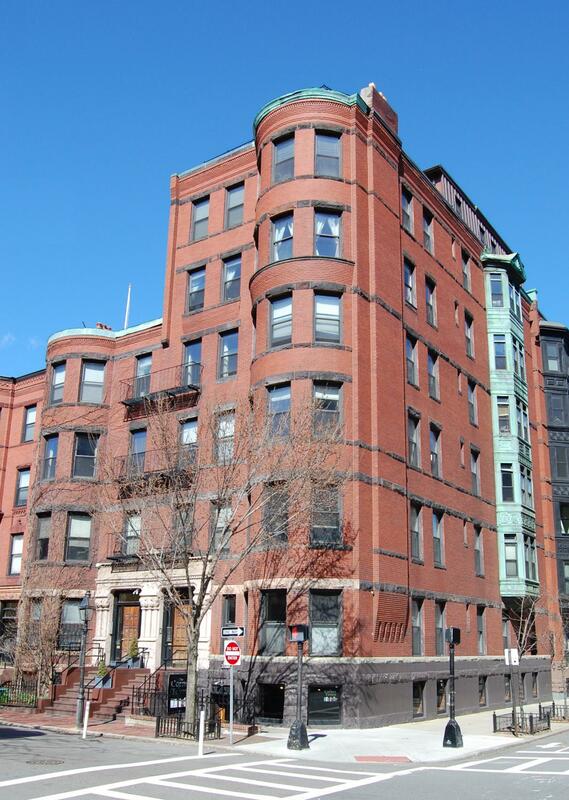 On June 10, 1981, Andrew Saggese transferred 421-423 Marlborough to the 421-423 Marlborough Street Corporation, of which he was president and treasurer. 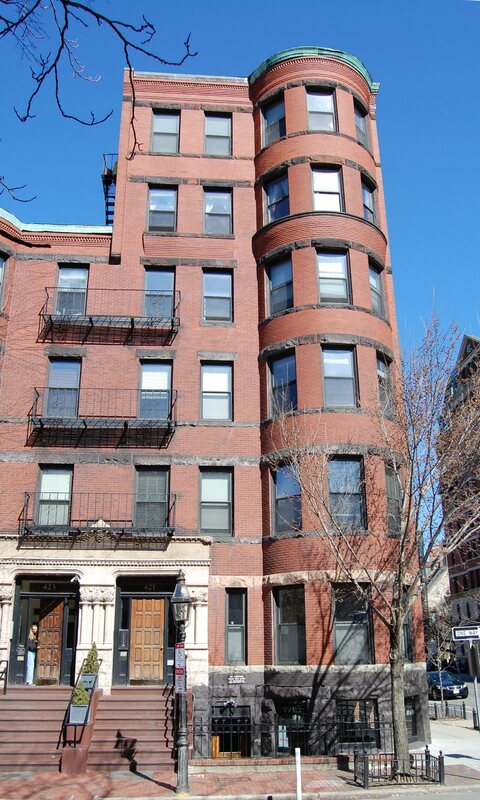 On June 26, 1981, it converted the buildings into 18 condominium units, thirteen residential units and one commercial unit at 421 Marlborough, and four residential units at 423 Marlborough: the 421-423 Marlborough Street Condominium. 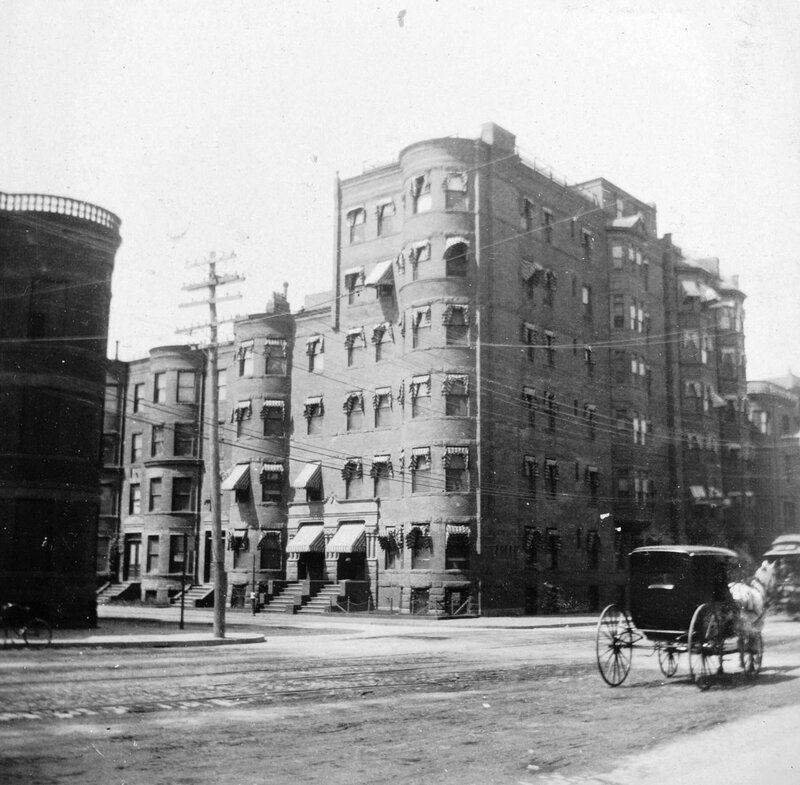 In August of 1982, Andrew Saggese filed for (and subsequently received) permission to conform the legal occupancy of 421 Marlborough with the existing use: twelve residential units on the first six floors and a thirteenth on the roof (a former maid’s quarters not previously included in the building’s legal occupancy as a separate dwelling unit), and a restaurant in the basement. The commercial unit continued to be occupied the Fathers Five bar until the early 1990s, when it became the Back Bay Pub. From 1993 to 2008 it was The Last Drop, and from 2009 it was the Corner Tavern.